ExperimenTor is a toolkit and network emulation-based testbed designed to support Tor research in a manner that promotes realism, safety, and scalability. The testbed consists of a set of tools for configuring, running, and analyzing whole-network experiments with an isolated Tor deployment running in the ModelNet network emulation platform. This testbed enables researchers to easily deploy their own experimental Tor network consisting of its own Tor directory servers and Tor routers with bandwidths and delays similar to those found in the live Tor network. Also, the testbed configures emulated Tor clients that can run any applications such as web browsers or BitTorrent. Real code: This isn't a simulator. The testbed runs real Tor code, arbitrary applications such as web browsers or BitTorrent clients, and any type of destination servers. Client and router models: Using data obtained from Tor's authoritative directory servers, the testbed can model the distribution of Tor router bandwidth in a manner that is representative of the live Tor network. Also, empirical models can inform the dynamics of the emulated clients' applications and traffic. Scalable network emulation: All Tor routers, clients, applications, and destination servers run in the ModelNet scalable network emulation platform. In short, ModelNet emulates network topologies with realistic link properties (e.g., delay, bandwidth, drop rate, etc.) using commodity hardware and OSes. 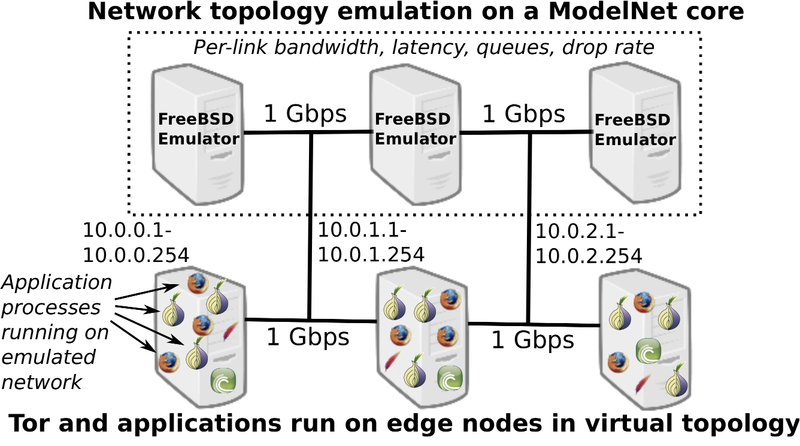 In contrast to small-scale experimental methods (e.g., running a single modified Tor client or router), emulating the entire Tor network at near-scale enables experiments that capture whole network effects. For example, one could investigate the performance of a new router selection scheme when all clients or routers adopt the new scheme, rather than just a few controlled by the experimenter. For more details about the testbed's motivation, design, or how it's been used to support Tor research, please see the publications listed below. Technical Report CACR 2011-29, August 2011. 4th USENIX Workshop on Cyber Security Experimentation and Test, August 2011. 11th Privacy Enhancing Technologies Symposium, July 2011. Trademark Notice: "Tor" and the "Onion Logo" are registered trademarks of The Tor Project, Inc. ExperimenTor is not endorsed or supported	by The Tor Project.